Pictured (l-r): Liea, Mariane and Dr. Anderson. We are here to make your appointments go smoothly. Below are some helpful hints that could help with that appointment. 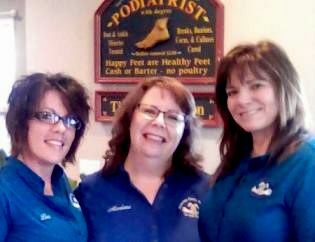 Is this the first time you have visited a podiatrist? Well, don't worry. This handy guide will prepare you for your appointment and help make the most of your time with the foot and ankle expert.